Clean Sleep is the only tech-focused company that leaves you with a dry, sanitized and like-new mattress. We spent years developing our state-of-the-art technology to give you the cleanest mattress possible. Each step in our process targets a different issue and together provide the most effective method to ensure a cleaner mattress in your home. Traditional mattress cleaning services either use chemical sprays or carpet cleaning equipment, usually only treating the surface. In most cases, this leaves your mattress wet and susceptible to mold and other fungal growth. 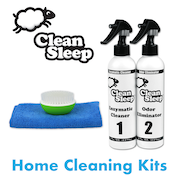 Conventional chemical cleaners can also leave residual odors that may affect sleep quality until they fully dissipate. Traps moisture promoting the growth of mold and mildew.